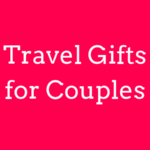 Looking for some gift ideas for the travel lovers in your life? We’ve got you covered with our updated travel gift guide featuring some of the best gifts for travelers in 2019. 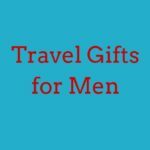 From fun and stylish to practical and useful, we rounded up the top gift ideas for travelers sure to fit any budget or style, including travel gear and essentials, travel stocking stuffers, eco-friendly gifts, travel gifts for men, travel gifts for women, gadgets and electronics and other travel inspired gifts. Keep digital devices and accessories organized with this handy electronics organizer. Noise cancelling headphones are a must for getting through a long flight. These Bose headphones are popular with frequent flyers but more affordable noise cancelling headphones are also available. A Kindle Paperwhite is perfect for avid book readers who appreciate portability. Travelers can charge their phones and other devices on the go without having to wait around a power outlet with this external battery. A must for any traveler. Protect electronics from power surges with the bonus of charging multiple devices at once thanks to 3 outlets and 2 USB ports. Sharing is caring. A headphone splitter is a great gift for travel couples and traveling families and allows you to connect two headphones so a buddy can also enjoy your playlist. A great gift for travelers that spend a lot of time outdoors is a solar portable charger to charge their phone and electronics. You can even attach this to your backpack while hiking to recharge. A journal is a great gift for travelers who still prefer jotting down notes and thoughts the traditional way. 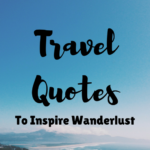 The travel quotes in this hardcover version provide inspiration but you can check out simpler options here . Compression socks don’t have to be ugly. Help your loved one prevent swelling and DVT with a fashionable and functional pair – this polka dot pair is especially stylish. Jet-setters will appreciate this airport stamp passport cover. Think carry on only travelers don’t need a TSA approved lock? Think again. Locks are great for keeping belongings safe in the hotel but also if forced to gate check a bag. Give the gift of good sleep. This eye mask is a favorite. Keep identity theft at bay with an RFID blocking wallet and passport holder. An affordable alternative to noise cancelling headphones, earplugs are a must to tune out loud hotel neighbors, street noise and annoying airplane passengers. A universal travel adaptor is a must for any international traveler. A slim and portable electronic toothbrush will surely make them smile. Best of all, the powerful sonic toothbrush is available in a variety of designs (from classic solids to fun prints). This travel inspired adult coloring book is relaxing and inspiring at the same time. Protect your laptop on the road with a travel-inspired sleeve. This Carry on Cocktail Kit will help them get through a long flight. This instant mini camera is fun for travelers all ages and comes in several cute colors. This travel inspired key chain is a cheap travel gift for someone that has the travel essentials. This globe Christmas ornament is a great stocking stuffer for a travel lover. This mighty little bag is reusable, washable, adorable, folds down to practically nothing and can hold 50 lbs! Perfect for carrying groceries and souvenirs but cute enough to use as a day bag too. Comes in basic black as well as a variety of fun colors and prints. A bamboo travel cutlery set is a great gift for the travelers who try to live a zero waste lifestyle or make small changes to be more eco-friendly. This travel pouch contains a knife, fork, spoon, chopsticks and a straw so they don’t have to use plastic utensils or straws while traveling. This Klean Kanteen water bottle is double-wall vacuum insulated and leak-proof so you don’t have to worry about condensation or unexpected spills. Traveling to countries where the water is not safe for drinking? Save money and the environment by using this personal water filter over bottled water. Update his toiletry bag to a lightweight version with waterproof lining. Does the man in your life travel for work? This nifty tie case prevents creases and wrinkles while also saving luggage space. Lightweight and breathable, this jacket has 22 (yes, 22) pockets to stash your gear. Help her stay organized on her travels with a bright-colored jewelry wrap. Keep toasty on flights with a scarf that has a hidden zip pocket to hold a smartphone, passport and money when traveling. A delicate chain necklace featuring a small compass disc pendant is a great gift for a woman that loves travel and jewelry. A trusty time-saver, space-saver and sanity-saver. BPA and PC-free tubes are soft and rugged, making it easy to squeeze out the contents when you want to. Help make that cramped economy flight a little more bearable. This memory foam neck pillow will support a weary traveler’s head and help make those zzz’s easier to catch. No one likes to mix dirty clothes with clean clothes while traveling. This cute laundry bag comes in 3 designs that travelers will love. Compact and suitable to keep contents dry in almost any wet situation. Protect wine bottles and other valuable items with this trusty inflatable travel bag. The quicker a towel dries, the sooner you can toss it in your luggage and be off on your next stop. The pocket-size system is the lightest “washing machine” around. Let there be light. 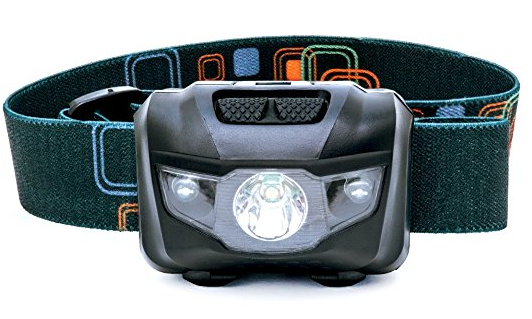 A headlamp is much more useful than a flashlight as you can still have two hands free. Lightweight and portable, this hammock is a welcome spot for outdoor adventurers to rest. If your loved one is a solo traveler this door stop alarm might give you some peace of mind. Not only does it prevents intruders from entering into a hotel room, it also sounds a loud alarm. Get your loved one the gift of time with Global Entry (which includes TSA Precheck). Tip: Use a credit card that reimburses you for Global Entry and this gift is free. There is nothing more that a traveler loves than a free trip. Get your loved a Southwest Airlines gift card for their flight and a hotels.com gift card or Airbnb gift card for their accomodation. Globetrotters can keep a fun record of their travels. Perfect for aviation enthusiasts, an airport code throw pillow from Airport Tag is a quirky way to show some airport pride. They have additional items with airport codes on their website including mugs, pouches, tote bags and T-shirts. Coasters provide a spot to rest drinks but the travel-theme will also remind them it is time to book their next trip. Travel lovers can plot where they have been or where they plan to go. The Journeys of a Lifetime: 500 of the World’s Greatest Trips not only makes a great coffee table book but also provides inspiration for future travels. A food subscription box that lets you sample different food or snacks from all over the world is a great gift for a traveling foodie. Good options include Try the World Food Box and Universal Yums. This travel fund piggy bank is a cute travel inspired gift for travel lovers. This compass is a great gift for travel lovers. You can even personalize the compass with free engraving. If the travel lover on your gift list enjoys scrapbooking, they will enjoy preserving their travel memories in this travel themed scrapbook. Active travelers can shoot their adventures with the newest version of this action camera. Ditch the bulky DSLR without sacrificing quality. The Sony Alpha a6000 gets good reviews and is one of the more affordable options. If you’re looking to splurge, check out the Fujifilm X-T1, Sony Alpha A7ii, Panasonic Lumix GH4, Olympus OMD-Em5 Mark II, Panasonic DMC-G7. The mini tripod is compatible with a DSLR, mirrorless, point and shoot and a smartphone. This gorillapod for smart phones comes with a bluetooth wireless remote for selfies and group photos. Not everyone loves a selfie stick but they make great gifts for solo travelers or even pairs obsessed with getting the perfect couple shot. Take better photos with a smartphone camera thanks to this fisheye, wide-angle, and macro lens kit. Sometimes you need a tripod to get a good shot. This lightweight tripod gets great reviews, is super affordable and comes with a bag making it easy to carry around. Another great option is this tripod which folds nicely making it easy to pack in a backpack or suitcase. If you are looking for an amazing gift for a traveler that loves photography, it does not get much better than a travel drone. The one we have our eye on is the DJI Mavic Air – it gets good reviews and is small, foldable and easy to pack. We would not mind if someone decided to buy this one for us! The DJI Spark is a more affordable and smaller option. For those travelers that want the newest gadgets, check out the new DJI Mavic 2 Pro and Mavic 2 Zoom. Wow. That’s quite a list of great travelling products you have there. The electronics organisers are very popular now. Usually we end up with a bag full of tangled adaptors and wires. The coasters are really cute. It’s good that they come with the holder as that makes a lovely display. The inflatable travel bag – I have never seen one of those before. What a great idea considering how bags are tossed around from flight to flight these days. What a comprehensive list! My favourite is, of course, a free trip 😀 Othewise, I’d go for a colouring book – it’d be perfect for killing time on the plane! some very good ideas here although I cannot use a selfie stick and can’t bring myself to buy one…lol…The bag for wires and stuff is genius I get so tired of pulling out everything in one shot as they are all tangled together. Love that so many of your products are practical…great list of items and I think I might need that laptop sleeve! I find the gotubes to be convenient for putting alcohol in them in case you don’t have a alcohol package for your cruise and it can be expensive we do this ha ha. 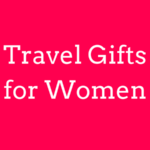 This is a great list of traveller gifts! 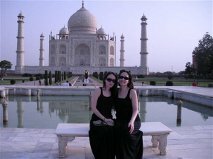 My sister does a lot of travelling so you’ve given me some great ideas for her. Those are some great ideas. I love the surge protector with USB ports. But I’m really curious about that pocket sized “washing machine”! oooh I love the look of the Journeys of a Lifetime book. So many great gift options – I am still to do my Christmas shopping so this is perfect! Boy are you good at lists! This list is comprehensive. I think the luggage scale is a must! Saves you alot of money and problems in the airport for cheap. Nice list however! Love the scarf with a zip! family is an excellent idea. I still have to buy a lens kit for my phone and plan to get one when I travel next. The digital luggage scale is for me the most important travel item considering how many times I got the weight of my luggage wrong. Thanks so much for this. It is really useful for photos especially when traveling solo. Wow! What a great list. I’m not looking to buy for anyone but man, this gave me tons of good ideas for myself It’s a really awesome detailed list! Glad it gave you some great ideas! 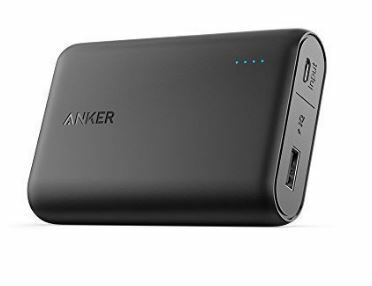 Those Anker battery backups are amazing! I might need to get another while I’m here. They really are useful! My phone battery runs out so quickly so cannot function without them. Great gift ideas! I love my Belkin and I’d definitely recommend that for a traveler! Noise canceling headphones are really essential, been wanting to get one of those for a while now (tho they’d be more of a gift to myself, lol). Anyways, all of the options are amazing! I liked your idea for Kindle paper white and earplugs, while reading I need some place of peace, so that I can concentrate myself. What a comprehensive list! My favourite is, of course, a free trip Othewise, I’d go for a colouring book – it’d be perfect for killing time on the plane! Awesome list! Scratch off maps are a great gift. I wish I had run across this before Christmas. These are great ideas! The most useful thing for me in this list is travel cord roll. I like your list as all things are very useful during traveling. Great gift ideas! It’s so helpful to me. 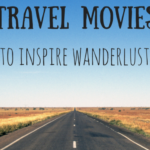 This is one article but gives a lot of gift ideas for a traveller. Once again, Thank you. I hope you like it. We both have been using that bag for years and like that it is so small and light. The solar portable charger sounds like a great idea! My phone is a few years old and sometimes it chargers quickly and holds the charge….other times it seems like it loses battery in an hour :/ I like the idea of the scarf with the hidden zip pocket too. I have the same problem with my phone battery! I wish they lasted longer. I own almost all these gifts so I guess I am a traveler! I have never seen the wine triple portable case before so I think it is time for some online shopping!